You visited me last night, as I knew you would eventually. It was my first night completely alone and instead of feeling lonely and sad, there was a certain peace over the household. I held your pillow – and your unwashed shirt, the one that says “I’m the reason the beer’s always gone” – and drifted off easily. Your presence is very much felt in this home, as it always will be. Your chair, your dreadfully messy desk, your pictures…your scent which is fading daily. You smiled your sweet smile and told me that I would be all right and for a second I believed you. You said I was strong, and for a second I believed you. You said you loved me and that I did believe completely. You said I would be happy again someday and I laughed and called you a liar. You smiled your sweet smile again. You told me to go ahead and laugh, swim, play, write, and yes, cry if I must. I asked you what it was like where you were – but you were gone, as quickly as you had appeared. I woke, as I often do these days, with damp cheeks and a huge empty hole in my heart. And I was alone again. Naturally. I lay facing my sleeping husband in the bright moonlight. It was nearly as bright in the room as if we’d left a light on. As usual, at least one part of our bodies was touching…no matter the size of the bed, we found each other. In this case our knees were touching. I stared into his face – so brightly illuminated, and listened to his gentle snores. I traced his features with my fingertips, over and over, as if trying to memorize them. The scars from skin cancer removals and drunken teenage car wrecks…the wiry eyebrows I had promised to trim but somehow had neglected to find the time to attend to. The smooth upper lip that had carried the moustache for so many years that I loved – but that he had come to hate. The lips I had kissed countless times. I knew every pore, every scar, every inch but I kept tracing, studying, reveling in his face so close to mine. He opened his eyes briefly and looked into mine. “You’ll never forget me” he said and gently kissed me…and we fell asleep. Thirty-six hours later I lay next to my husband in the grassy median of I-80 in Nebraska, under a clear blue sky in the warm sunshine, as paramedics worked frantically over him. I held his hand and looked for the last time at the face I had loved so much for so many years. I whispered my goodbye, and promised never to forget. And I never will. Today is my sister’s birthday. She is a little older than I am (although most people assume I am older since I stopped coloring my hair years ago). We are in the back row (I’m on the left). She is the only person left on earth who has known me since the day I was born. She knows me probably better than anyone and loves me anyway. We make quite a pair – she has a hearing loss and I am very forgetful. She can remember anything if she can hear it, and I can hear everything, but can’t remember it. I wish I could give her a birthday hug in person, cyber hugs just don’t cut it. I am recovering from a 3 day weather-induced migraine/sinus splitting headache combo. It was pretty rough. I may, or may not, have left stupid comments on some blogs. If I did, I apologize. If I didn’t, I wish I had, I can be pretty entertaining on medications…. I attended a memorial service Monday evening for one of my nursing students who died from a heart attack. He was a great guy – an older student (35), large, loud, bright and funny. He was a husband and father of 5. He came from a very large family with 13 siblings, many adopted. His cheery presence will be greatly missed both in the classroom and in the nursing lab I run for the college. He worked full time, went to school full time and was a father – full time. He laughed about burning the candle at both ends. He lived on Red Bull and other “energy” drinks to keep himself alert and constantly moving. His wit was razor sharp and his capacity for absorbing minutiae was incredible. His widow, his children, and his siblings each read a letter written to say goodbye. I have never, and probably never will, write words as poignant as those read that night. I pray that I will never have to. Imagine my surprise to find that I am a finalist in the caption contest over at the Good Greatsby’s Blog. Please, I am BEGGING you, go there and vote for my caption. I will owe you, big time. I will do all kinds of things for you, like belch when you feel full, sleep for you when you feel tired, and bottle up some sunshine and send it your way on gray and gloomy days. I don’t make offers like that to just anybody, either. So get on over there, and vote. Thanks. Here’s hoping the rest of the week will be better. 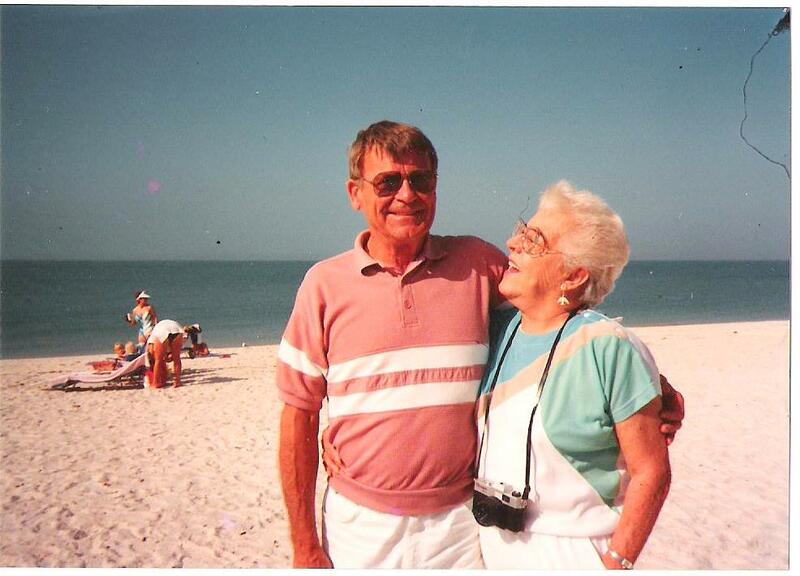 Betty and Calvin in warmer, happier times. In the very early morning hours I lay next to my husband – we were supposed to be sleeping, but neither seemed to be capable of staying in that peaceful state. We didn’t speak, each lost in our own thoughts as we drifted in and out of slumber. We listened to the furnace try mightily to keep up with the frigid December temperature in the largely uninsulated home, and the steady drone of an oxygen concentrator in the next room. He had a good idea of what was coming, I’m sure. On the other hand, as nurse, I knew exactly what would transpire. We held hands under the covers, our toes touching near the end of the bed. It was cold, very cold in the bedroom of the mobile home that was his mother’s “summer” home – the rest of the year she lived in Florida, in the house I now call mine. She and my father-in-law usually left for Florida in the fall – when the air became thick with smoke from burning leaves that robbed her of what little breath she could draw. Her lungs had been damaged from whooping cough as a child, and a life-time of smoking had exacted a large toll on her weakened lungs. Earlier that fall I had sat with her in a hospital room – she had insisted – when her pulmonologist delivered the diagnosis. Cancer. Small cell lung cancer. Rapid-growing and likely to spread if untreated. She clutched my hand, gasping for breath, but stoic. She couldn’t bring herself to speak so I asked the questions I thought pertinent. I was her medical liaison. She listened as the pulmonologist outlined treatment options and indicated his thoughts on her prognosis. She left the hospital, armed with referrals, brochures, and faint hope. She made plans to return to Florida and decided on a course of treatment that involved both radiation and chemotherapy. To me, though, she didn’t seem at all convinced that treatment was the right choice. When we spoke, I told her I would support any decision she made and would do my utmost to help navigate the maze of oncology health care and cancer treatments. Or not. She eventually decided to remain in Indiana – planning the trip to Florida overwhelmed her and she hadn’t much fight left. Eventually, she enlisted Hospice care, and made her peace with God. She continued to entertain visitors from her little desk near her large “window on the world”. She ventured out occasionally, but every excursion drained her very limited reserves. Her breathing, never good in all the time I’d known her, became more labored and ragged, and she struggled mightily with even the simplest of tasks. Eating was such hard work. Dressing, too. I helped her shampoo her hair and styled it for her each week – and trimmed it when necessary. My husband arranged to spend as much time with his mom as he could over the next few months, and I visited on my days off from the hospital. Her daughter visited before she became too sick, too weak to enjoy the company. We watched her weaken in body – but never in spirit. She had occasional bad days but was rarely tearful. Her weight dropped and she was unsteady on her feet. On her last outing from her home, she fell and broke her shoulder. Ten days or so after her fall we had a tremendous blizzard. I was stuck at the hospital and worked an 18 hour night shift before a replacement could make it in to relieve me. I was too exhausted to try to drive home and unsure if I could make it there, anyway. I stayed at my son’s home a few blocks from the hospital and it was after just a few hours of sleep that I received a call – the hospice workers had determined that the end was near. She had asked for me to come. So I did. The highways had been mostly cleared but the below-zero temperatures were brutal. A hospital bed was set up in the living room, near the window she loved so. She was exceptionally weak, but lucid. Over the next 24 hours she became too weak to get up to use the bathroom, so I contacted Hospice to see about getting a catheter for her – it was too painful to turn her to put her on a bedpan or change her bed linens because of the broken shoulder. I impressed my father-in-law with my ability to completely bathe a person in bed without spilling a drop of water and my ability to change the linens with my mother-in-law still in the bed. But mostly I tried to see to her comfort. Morphine and Ativan. Placed under her tongue because she could no longer swallow. Ice chips, and vaseline for her parched lips. My husband and his step-father (her husband, my father-in-law) stayed by her side. Her older son was on his way, due in the next day or so, and a steady stream of friends and neighbors called or stopped by. It was evident to see that she was much loved. Even her physician stopped by on his lunch hour – the kind of thing you only find in small-town America. The hospice nurses were wonderful – loving and respectful to her and utterly dedicated to her comfort. Her older son arrived as expected. She continued to stubbornly, and bravely, cling to life. But after three days of hanging on, in those early morning hours, we were not surprised by my father-in-law’s knock on the door. “It’s time,” he said. We got up hurriedly. I listened to her lungs – no breath sounds throughout most of her chest, and only gurgling noises up near the collarbones. Her lungs had filled completely with fluid. Her breaths came irregularly – long, agonizing silences in between. Her limbs were mottled and blue. And oh, so cold. I sat by her side and held her hand – she looked at me, gasping, eyes clouded but seemingly focused. She turned to her husband. Her husband leaned in close and spoke softly in her ear. “I’m here. Right here. I can fix almost anything” his voice caught. “But I can’t fix…this. I love you”. A tear slid from his eye. He placed a kiss on her forehead, then rested his forehead on hers. His tears fell on her face. I leaned in and whispered in the other ear. “I’m right here. You go ahead. We’ll be all right. We’ll take care of each other. You don’t have to worry about us. We’ll be fine.” My own tears flowed onto her pillow. She breathed a few more shallow breaths then slipped quietly away. We held onto her for a while, then wiping our eyes, hugged each other. When the oxygen concentrator was turned off – then, and only then, was she truly gone. The silence made it official. I now live in the Florida home that had been my mother-in-law’s. Every day I am surrounded by her spirit, which was mighty. I was always glad that we had come to love each other because, after all, we both loved the same man. And I was honored to care for her at the end. On Day 3 I received word that my grandmother was in the hospital and not expected to live. You may be asking yourself “Self, what is that woman with an AARP card doing with a Grandmother still alive?” Good question. Grandma became a grandma at an early age when her only child (my stepfather) married my mother, who had 2 small children. She was probably 38 or so at the time (my head is still tender and math is beyond me at this point). I was saddened by the news, and then received another phone call – Grandma had, indeed, gone toward the light. This presented a dilemma to me as I received a 3rd phone call. The service for Grandma was going to be held on Saturday and I was 1300 miles away. I had planned on driving north on Saturday, and by my calculations I could not even jump immediately into the car to reach my destination in time for her memorial. Never mind that I had a migraine and could possibly kill myself and others by even attempting a long-distance trek such as that. I did what any prudent migraine sufferer would do, I popped some pills and went back to bed. The next morning I debated (as well as I could with a throbbing head and nausea washing over me) about just proceeding with my plans for travel and missing the service or flying to the Midwest, attending the service and flying home, only to turn around and drive north within a few days…..What to do, what to do? In the end, I decided to pay my respects. I booked a flight, arranged a rental car and packed what I could manage given the state of my head (and mind). I am surprised I actually ended at my destination given that I couldn’t see or think straight at the time and was under the influence of powerful drugs. I am also amazed that I remembered to pack underwear and medications, and even managed a suitable outfit. I loved my grandmother; she didn’t treat me differently because I was a step-granddaughter. She pretty much treated everyone the same – and that is not to say that she was sweet to everyone (or really – sweet to anyone). She wasn’t a cuddly, loving grandmother – although she could be on rare occasion. She often had a sharp tongue and shrill voice. She didn’t want people making a mess in her immaculate house. She was stubborn and opinionated, and looked out for Number One. She feuded with family members and at the time of her only child’s death, was not on speaking terms with him. My grandchildren loved her, none-the-less and I took them with me on my visits. I gave my grandmother monthly injections of Vitamin B-12. Once when I was giving her the injection, she yelled loudly. I was mortified – every month she received her injection without a sound. Turns out she was only trying to scare my 2 grandchildren who had accompanied me on that day. She thought it was hilarious – and often retold the story. I did not see the humor – but it was classic Grandma. 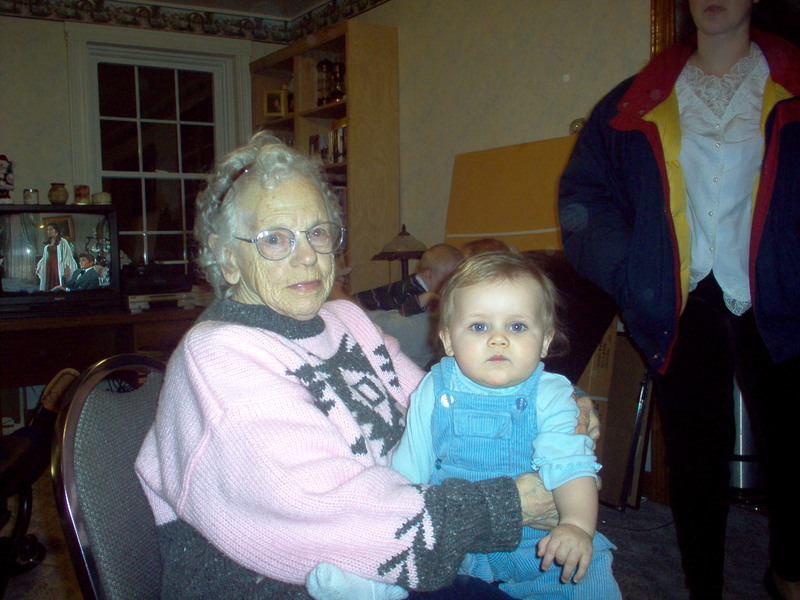 One Christmas Day I went to see Grandma with my younger son, Lefty, in tow. She met me at the door and said “Duke is dead”. Duke was her elderly dog – and sure enough, he lay dead in a box, covered with a blanket she had crocheted. She asked us to bury the dog for her. Lefty gathered a few tools from the garage, a pick axe, a shovel and proceeded to the back yard where Grandma had a sort of pet cemetery. Lefty could not budge the frozen earth and he and I took turns with the pick ax chipping away molecules at a time until a hole was big enough to hold the dog, the blanket and the box (but only if we smashed the box in). Neither Lefty nor I were dressed for sub-zero outdoor work and our fingers froze to the pick handle. After many hours of pick work, we managed a shallow grave and unceremoniously shoved the box and contents into the hole. We covered the crumpled box, tamped the frozen earth back into place and drug our shivering selves into Grandma’s always superheated home. She was bawling uncontrollably and we (almost) felt bad about our treatment of her departed companion. Lefty and I laughed about that incident on the day of her service. I stayed a few more days and made a few more memories with my grandchildren. I pray one day they will remember me fondly. And bury my dog if needed.